"Life as a Woman on Watseka Avenue" a personal Story, published in the book Hare Krishna: The Post-charismatic Fate of a Religious Transplant, by Edwin Bryant, Ph.D., and Maria Ekstrand, Ph.D., eds., Columbia University Press, 2004. Myth and Themes of Ex-membership essay explains the emotional experience of exmembers (unabridged), as published in ICSA e-newsletter, Vol. 5, No. 1. Abstract Surrealism, ICSA Today, Vol. 9, No. 1, 2018. My ex-member artwork. Writing Betrayal of the Spirit: Autobiographical Writing As Therapy, ICSA Today, Vol. 5, No. 1, 2014. "My Study of Child Abuse in Cults", published in the book, Take Back Your Life: Recovering from Cults and Abusive Relationships, by Janja Lalich and Madeleine Tobias, eds., Bay Tree Publishing, 2006. "Authoritarian Culture and Child Abuse in ISKCON", chapter sixteen in the book, The Phenomenon of Cults from a Scientific Perspective, by Piotr T. Nowakowski, ed., published by Dom Wydawniczy Rafael, Cracow, Poland, 2007, ISBN: 978-83-7569-025-5. Thirteen Years After Leaving ISKCON, written July 30, 2001. Thirty Years After Leaving ISKCON, written August 4, 2018. Authoritarian Culture and Child Abuse in ISKCON, Cultic Studies Review, Vol. 3, No. 1, 2004. Also published as a chapter in a book by Piotr T. Nowakowski, see below. Also a presentation entitled, "The Violation of Innocence: How Cults Abuse Children," presented at the annual ICSA conference in Edmonton, Alberta, Canada, June 11 - 12, 2004. Can Cults Change: The Case of ISKCON essay in response to a 1999 ICSA panel discussion on whether ISKCON had changed. Book Review: Servant of the Lotus Feet, by Gabriel Brandis, Cultic Studies Review, Vol. 4, No. 2, 2005. Book Review: Modern Religions, by Elliot Benjamin, ICSA Today, Vol. 3, No. 1, 2012. Post-Cult Guilt, presented at the 2016 annual ICSA conference, Dallas. Notes from the presentation includes art therapy work to illustrate how guilt affected me after leaving ISKCON. ABCs of Dangerous Cults, published at icsahome.com, January 6, 2015. Editor's Note, ICSA Today editors invited me to write the Editor's Note for Vol. 8 No. 2, 2017. ICSA Index of my writing published by ICSA. Betrayal of the Spirit: My Life Behind the Headlines of the Hare Krishna Movement, my memoir, University of Illinois Press, 1997. Child of the Cult, my book on child abuse in cultic groups, 2012. Cult Survivors Handbook: Seven Paths to an Authentic Life, my book for people who leave their groups, 2010. ISKCON Child Abuse History index of the Gurukula section, regarding children raised in ISKCON. Child Abuse Symptoms symptoms of child abuse, more information for survivors. Child Abuse Information an index of all child abuse information available through this site. Story Matters Stories from Krishna's life and other Vedic scriptures that condemn child abuse. ISKCON Child Abuse History an index to articles about the ISKCON child abuse history. ISKCON Timeline includes dates when boarding schools opened and closed, along with other information vital for the first cohort of ISKCON children to put their upbringing in context to what was going on in the organization. Children of ISKCON vs. ISKCON the lawsuit timeline. Children of the Ashram the story that broke the silence on ISKCON child abuse. ISKCON Timeline Documents documents referenced on the timeline. From a Teacher memories of the Dallas school, part 1. From a Teacher memories of the Dallas school, part 2. Gurukula Grads Speak statements by former gurukula students. ISKCON Child Abuse Lawsuit Documentation referenced on the lawsuit timeline. Mother's 1988 Letter an early complaint about child abuse, before the truth came out. Results of 1988 GBC Survey a survey about child abuse awareness. Standards for Boys document spells out typical gurukula discipline. How to Overcome Cult Superstitions and Negative Thought Forms Strategies to fight cult mind control adapted from the book On Tyranny, by Timothy Snyder. Presented at the ICSA Regional Conference, Santa Fe, November 5, 2017. Beware if You Follow Your Destiny an essay about the consequences of taking part in a cult. Women in ISKCON a page of my essays and an unpublished editorials about women's place in ISKCON. ISKCON as an Addictive Organization an essay that analyzes ISKCON in terms of the book Addictive Organizations, and compares ISKCON to an addictive organization. A Letter to ISKCON on its Fiftieth Anniversary my opinon on where ISKCON stands after fifty years. Governing Body Commission My 1988 speech to ISKCON's board of directors in Towaco, New Jersey. Letter to a woman who lost her friend to a cult a good resource for anyone in a similar situation. Western Mind and Gurus thoughts on why the path of discipleship may not work for Westerners. Boundaries a list of healthy emotional boundaries for cult survivors and abuse survivors. The Nature of Cults, questions explained, May 13, 2002. Hare Krishna Link Page Index index of all link pages related to ISKCON. The Betrayal Files an archive of documents discussed in Betrayal of the Spirit. Hare Krishna in the Movies the best collection of movie clips on the Hare Krishnas. Child of the Cult by Nori - this concise book tells the stories of five women who each grew up in a different religious cult. Nori has a master degree based on working with abuse victims and perpetrators, and this is her main book on child abuse. 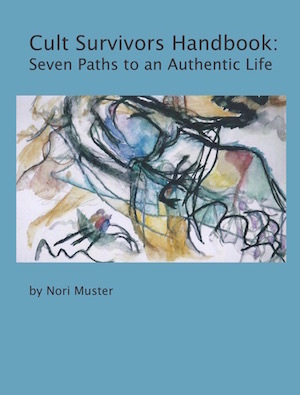 Cult Survivors Handbook: Seven Paths to an Authentic Life by Nori - a guide for former cult members, based on her graduate research after leaving ISKCON. Betrayal of the Spirit: My Life behind the Headlines of the Hare Krishna Movement by Nori - a memoir of ten years in ISKCON, 1978-1988, including what the organization went through in the decade following the death of Founder-Acharya A.C. Bhaktivedanta Swami Prabhupada.